Although the EPA states that the most common way people in the U.S. are exposed to mercury is through eating fish high in the element, the EPA also suggests that mercury is contained in some of the products we may use, and may be found in our homes. In 2012 the U.S. Food and Drug Administration (FDA) suggested that New York was seeing elevated mercury levels in people exposed to mercury via skin products. The U.S. government suggests that skin lotions and soaps are brought into the country by mail or by international travelers who are supplying demand to immigrants in Hispanic, Asian, African, and Middle Eastern neighborhoods. Therefore, immigrants and minority groups are at higher risk for mercury poisoning from skin-lightening creams. Research also suggests that skin-lightening creams are not only harmful to the person using it, but also to the people who live in the same household. The California Department of Public Health (CDPH) investigated participants who had elevated blood mercury level results in a health study in 2010, and identified unlabeled skin-lightening creams to be the likely source of exposure. According to the CDPH, reasons for using the skin-lightening creams included fading freckles and treating acne. 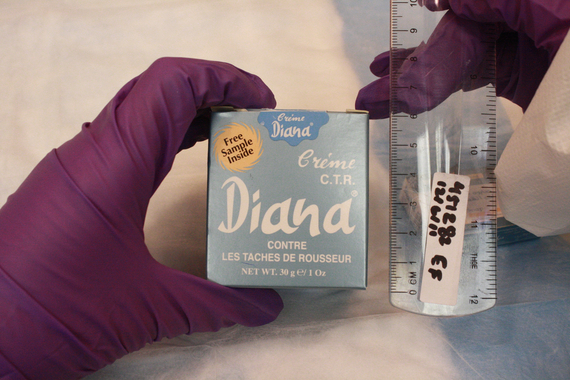 Chronic exposure ranged from months to five years, and the cream was typically applied to the face. The research also found that all of the creams were produced in Mexico. Laboratory results suggested that mercury levels were higher among younger children, which makes them more vulnerable since toxicity depends on host size. If you know anyone using skin-lightening creams, please advise them about the potential dangers of mercury toxicity. If you have any concerns you should reach out to your health care provider or you can call the 24-hour poison center at 1-800-222-1222.